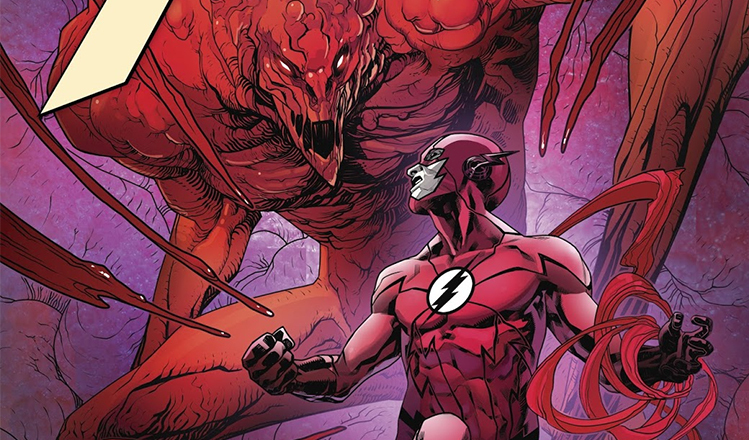 Barry Allen is having a terrible, horrible, no good, very bad day in The Flash #30. Not only have his Negative powers wrecked havoc around him, but they have also severely dampened his mood and made him irritable – he’s ready to lash out at his coworkers and friends with hardly a moment’s notice. He nearly gets himself fired after blowing up at Singh – who hurt even my feelings by bringing up Iris, by the way – and Forrest. Thankfully, fellow CSI Kristen is on hand to prove that other people have it rough too and gets Barry back on track to cracking the case. Which he soon does, uncovering the culprit after one good sleuthing session and bringing up face to face with the villain Bloodwork. We get an origin story and a tense battle sequence all in one, but the focus is more on Barry’s continued inability to control his powers. At this point, however, it’s starting to feel a little like there won’t be many consequences for these dangerous new abilities. I don’t want to see the Flash kill anyone, of course, but so far he’s been a witness to a murder and saved from becoming one himself by circumstances out of his control. 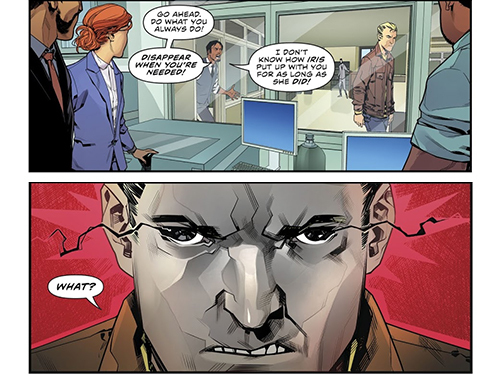 When you add that to his behavior at work, and how it still doesn’t feel like his job is at risk, I wonder how dark Williamson is willing to take our hero… and how long the arc can last before Barry is restored. 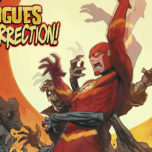 The Flash #30 does an excellent job of showcasing Barry’s emotional breakdown, but it’s a shame that the characters of CCPD are more present now that his relationship with them borders on antagonistic. Hopefully we’ll get to see Singh and Forrest more often as actual friends to Barry rather than victims of his fury. Meanwhile, I assume he probably feels too guilty or confused to check on the Wests, but it still seems odd that he wouldn’t even ask after Wally’s health given how present he and Iris have been in Barry’s life up to now. 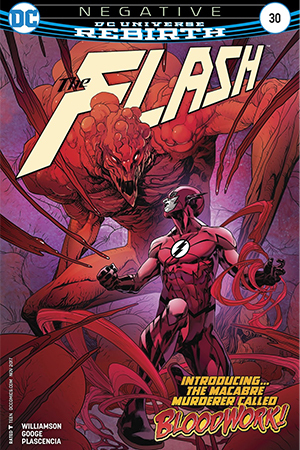 The artwork is perhaps the standout part of The Flash #30, because it’s so fresh and inventive. 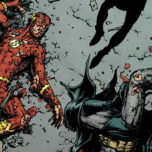 While sometimes the faces look slightly distorted – and Barry certainly looks different under Googe’s hand than he did under Di Giandomenico’s – the expressions clearly capture whatever anguish or rage the characters are feeling in the moment. Not only that, but Plascencia’s colors also emphasize the change that’s taken place in Barry just as Googe deftly handles the Negative Speedforce with blur effects to complement black lightning. And as you can see above, there’s a flashback page that is potentially more entrancing for its artful depiction of blood and creative use of space than for Bloodwork’s actual backstory. Not that the information on this new villain isn’t useful or interesting, but after the buildup we still have to see just how formidable he will be. Verdict: 3.5 out 5 stars. 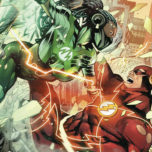 Bloodwork makes for an exciting new villain with a compelling story to tell, which gives The Flash #30 more of an edge over previous issues in the latest arc. 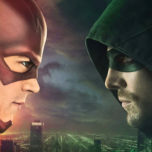 I hope that battling him will pull Barry out of his funk more and make him start facing his demons rather than hiding from them.